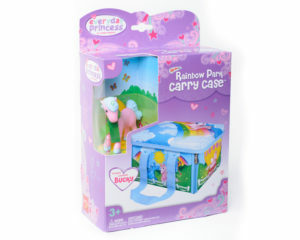 PLAY, STORE AND MORE; this versatile small toy box stores up to 40 ponies; then quick as a zip, opens to a play mat rich in imaginary scenes; including rainbow bridge, gorgeous garden and pond to picnic on. OPEN MAT measures 17.8 inches by 15 inches. Neat-Oh! knows that every little girl is a princess, every day. The Everyday Princess 40 Pony Rainbow Park is part of Neat-Oh!’s line of Everyday Princess – No Crown Required line. A line of beautiful dolls and toys devised to encourage imaginative play – and to empower young girls to design and control their own creative realm. 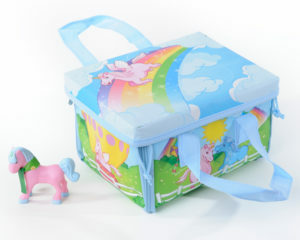 ZipBin® Everyday Princess™ 40 Pony Rainbow Park is enchanted fun for everyone. 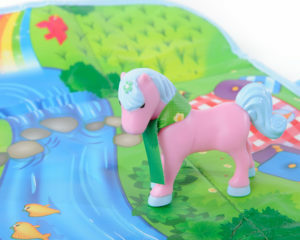 When unzipped, the Playmat has fabulous flowers, a beautiful bridge, a gorgeous garden, picnic and pond and are the perfect places for your fantasy ponies and accessories. When play is done, the ZipBin® Everyday Princess™ 40 Pony Rainbow Park becomes a toy carry-case in a zip, capturing the toys inside for easy clean up! Weighing only half a pound, this mini playset includes one pony and is the perfect size for travel. Easy to clean – wipe with a damp cloth. Have fun and decorate your room with all of our Neat-Oh!® Everyday Princess™ – No Crown Required products.